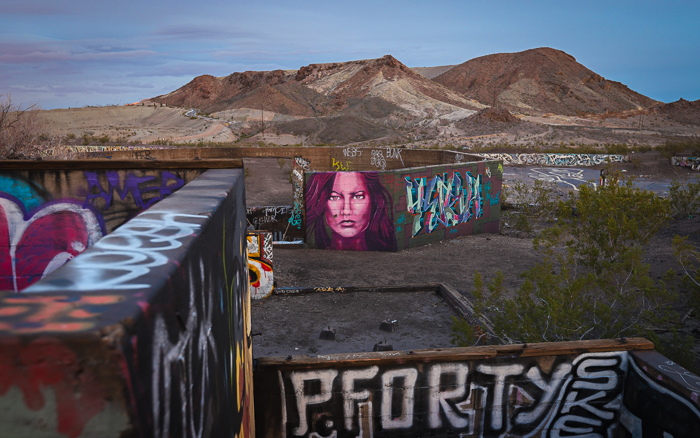 Three Kids Mine on the outskirts of Las Vegas, Nevada may be less worthy of mention for its past than for its post-use roles due in large part to its position on the increasingly-encroaching fringes of the urban center. Built in 1916 and opened the following year, Three Kids Mine consists of a massive 300 foot deep open pit, along with two other nearby smaller pits from which high grade manganese ore was mined. Though today it sits not far from the boundary of the Lake Mead National Recreation Area, at the time of the mine’s construction, the Hoover Dam was still over a decade away from breaking ground, and the city of Las Vegas, located about 15 miles from the mine site, was only 11 years old with a population of about 2000 people. 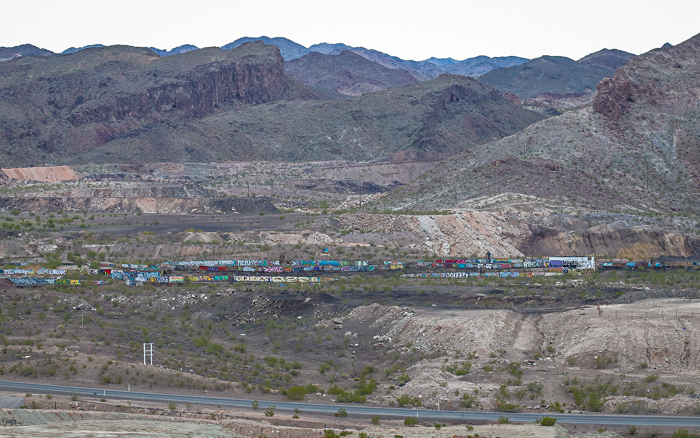 Initially, manganese ore from the mine was hauled down to the rail yards in Las Vegas by a 10-horse team pulling three heavy-duty freight wagons and a feed cart hitched to each other. Shortly after, a mill was constructed beside the main pit to process the ore onsite. 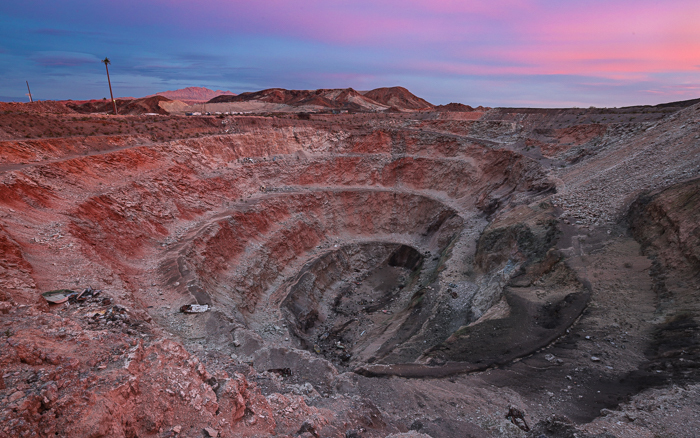 According to the mine’s one-time owners, the Manganese Ore Co., the mine was at one time the largest open pit deposit of manganese ore in the US, while the leaching process took place in the largest acid-proof thickeners ever constructed. The mine saw three periods of major activity, each coinciding with significant military campaign eras: World War 1, World War 2, and the Korean and Cold Wars. 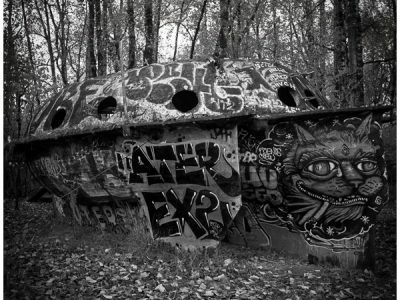 Though by 1961, most of the rich ore had been depleted, and the government terminated the mine’s contract. Much of the mining operation was dismantled the following year. Sitting on BLM land, the area was used by the federal government for storage until 2003. Following its closure, the earlier completion of the Hoover Dam and the formation of Lake Mead, along with the growth of Las Vegas as an urban and tourism center left the abandoned mine and its tailings in a no man’s land of BLM-controlled desert mountains. Immediately west of the empty mine pit and concrete mill ruins is 1.8 million cubic tons of black sludge, the result of processed mine tailings mixed with diesel oil and soapy water and transported into a manmade reservoir. [This area is visible in Google Maps Satellite Images today, immediately across E. Lake Mead Parkway from Lake Las Vegas Parkway.] Those with knowledge of these tailings pools contend that even today, beneath the hardened topmost 3-or-so feet of dirt, there is pure liquid sludge 30-70 feet deep. In 1987, the sci-fi film, Cherry 2000, starring Melanie Griffith, used the mine and pit for filming. Though the movie itself is forgettable, Three Kids Mine was amongst filming locations exclusively throughout southern Nevada like Goldfield and the Valley Of Fire used for filming. 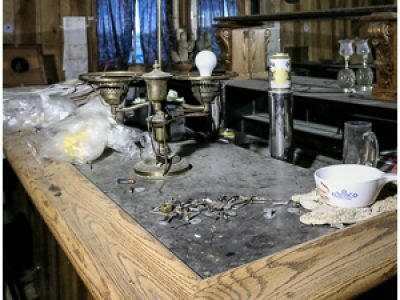 A mix of pollution, multiple-entity ownership, and bureaucracy even less viscous than the sludge left behind has slowed any cleanup of the site. Though now the Lake Mead National Recreation Area is approaching 8 million visitors annually, making it the US’ sixth most visited national park site in 2017 and Las Vegas development has reached almost to the mine site itself with the Lake Las Vegas development located directly opposite the road. 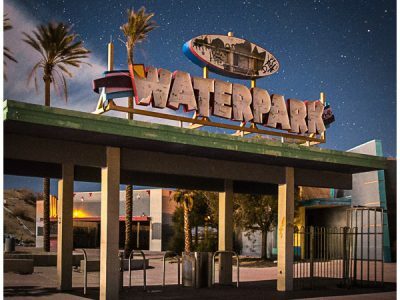 Most recently, the City of Henderson purchased the land and announced plans for a large-scale development on what they have rechristened “Lakemoor Canyon”, though this is all pending a cleanup with cost estimates varying from $300 million to $1.2 billion. White the pit itself remains a toxic hold that continues to slowly accumulate dumped loads of refuse, car tires, and a surprising number of discarded small boats thrown into it, the mill ruins grow increasingly colorful as graffiti writers continue to cover its available surfaces. 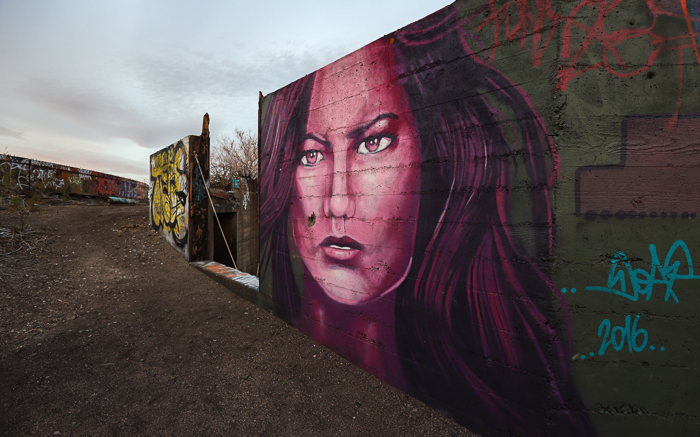 The most well-known piece, which remains an attraction even for non-writers, is the Wheel Of Misfortune piece by politically-deviant crew, INDECLINE, whose 2012 mural covers most of the surface of one of the mill’s thickeners and can be seen by flights on path to Vegas’ McCarran International Airport. 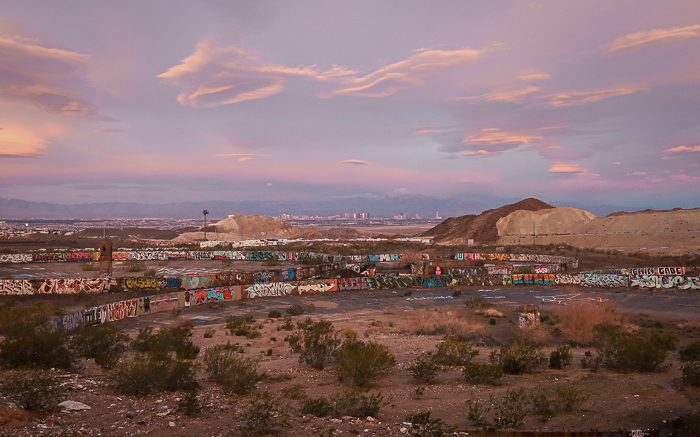 Constructed when the city of Las Vegas was only 11 years old and had a population of around 2000 people, today the Las Vegas Strip glows within view of the abandoned Three Kids Mine. The open pit mine is about 300 feet deep. 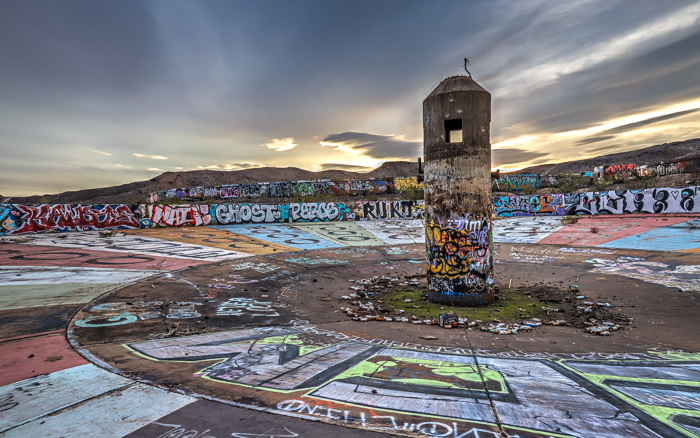 Dismantled in the 1960’s, and finally seeing complete abandonment by the federal government in 2003, Three Kids Mine has since become a toxic playground for graffiti artists, its colorful concrete floors visible from the flight path of planes flying into and out of McCarran International Airport. Once distant from populated areas, the open pit mine produced enough manganese ore for a mill to be constructed adjacent to the pit. Today, the graded hills of the Lake Las Vegas development sit directly across Lake Mead Parkway from the Three Kids Mine location. At one time, the Three Kids Mine was the largest manganese ore pit mine in the United States, while the mill contained the largest acid-proff thickeners in the world. 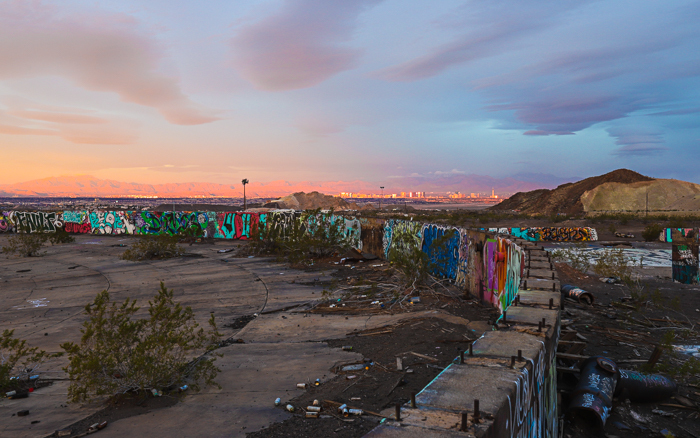 Today those ruins remain awaiting a cleanup estimated at over $300 million while the Las Vegas Strip shines down the hill. 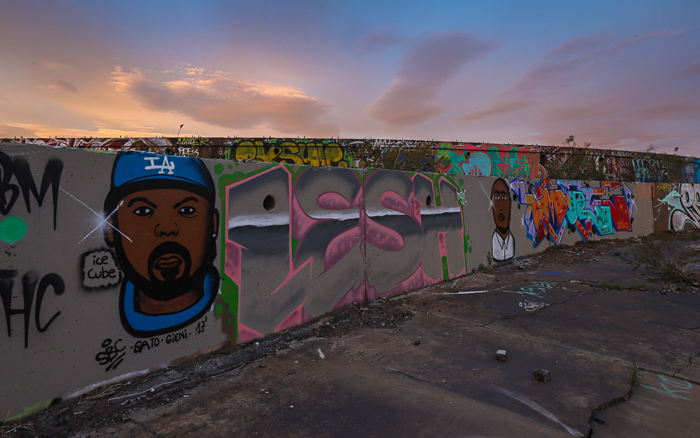 Graffiti artists make use of the abandoned mill’s walls. The area contains an estimated 1.8 million cubic tons of sludgy mine tailings as a result of Three Kids Mine’s manganese production. Graffiti on an old mill wall at Three Kids Mine. 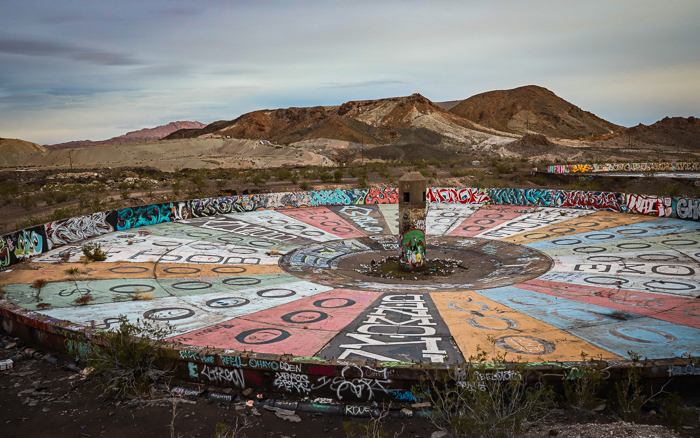 Wheel Of Misfortune, painted by the INDECLINE art collective in 2012 remains a popular mural and has made Three Kids Mine a destination for some. Better views are available by searching the location on Google Satellite Images. Wheel Of Misfortune at Three Kids Mine; Las Vegas, Nevada. Three Kids Mine in a mountainous area dubbed “Lakemoor Canyon” by developers eager to begin clean up of the old mine site in order to facilitate the development of residential units on the former mine site. 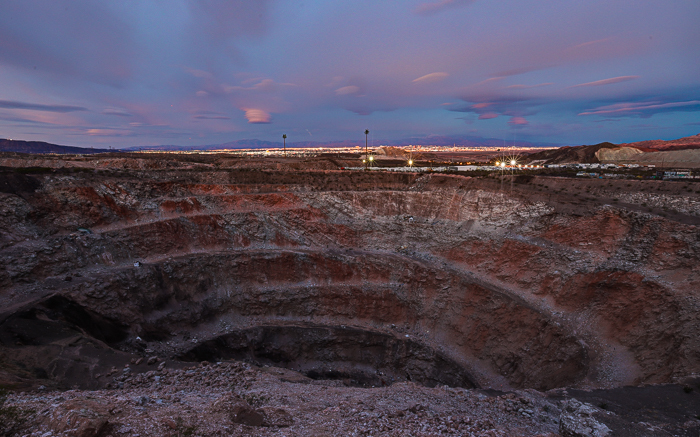 This picture is taken from the Lake Las Vegas development, north of the abandoned mine.